"All That Is Beyond Hearing" is the result of my investigation into the history and provenance of a pair of curious documents, the 'Manual of Lost Ideas' and its 'Commentary'. It recounts what little is known about the man believed to have created the Commentary, an Anglo-German named Arturo Ott who died just after World War II. The essay is accompanied by images from a series of albums that Ott created in which he collected found images under an idiosyncratic taxonomy of his own devising. This project was inspired by W.G. Sebald both in the way that I use the accompanying photographs and in the ways it addresses the problems of memory. For instance, Arturo Ott suffered from Capgras syndrome, a real though rare condition whose victims suffer under the delusion that individuals near and dear to them have been replaced by exact doubles. 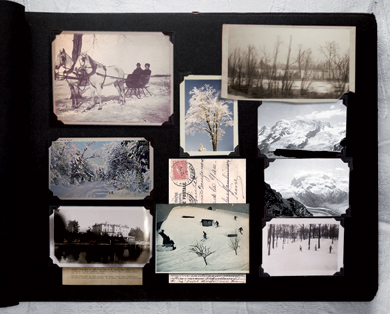 For the Collector's edition of Searching for Sebald I created a single-sheet 'study document' that analyzes a page from Arturo Ott's "Winter" album. Surrounding a closeup photograph of this album page are 5 related images found in others of Ott's albums, with red lines connecting the pairs of similar images. The purpose of this visual comparison was an attempt to uncover the workings of Ott's mind. For the Artist's "suitcase" edition of Searching for Sebald, I created a limited edition of 100 small, sealed memory cases entitled no longer not yet. The first group I made each encloses an image from Ott's albums (the 'no longer' of the title) and a handful of wildflower seeds (the 'not yet'). The second group of memory cases encloses dirt, sand, salt, raw pigments, and botanical materials including seeds. Each unique box constitutes both an abstract landscape in the representational sense, and an actual low-relief landscape in the physical sense. Salt introduces a destructive ('no longer') potential into these miniature dormant ('not yet') ecosystems.